If Im adding outlets/actions to a viewcontroller, I want to be able to launch xcode. Would it be possible to display the xib below the .pas like it does in the solution explorer ? 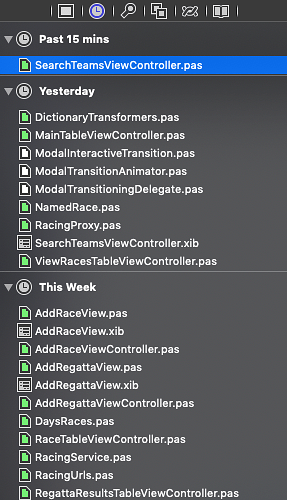 Im editing SearchTeamsViewController.pas and I want to click on the xib so that I can select edit in xcode. Im finding the view really handy because if Im updating Im often working in several files and its easier to navigate using the view rather than the solution explorer. nope, sorry. the recents panel needs a flat view, otherwise things get very confusing, if the status doesn’t match for both (all) nested files. some of my projects have dozens of nested files.